I tell everyone, “I was a gardener before I was a paper artist,” and this is why my flowers come as close to nature as I can possibly make them. 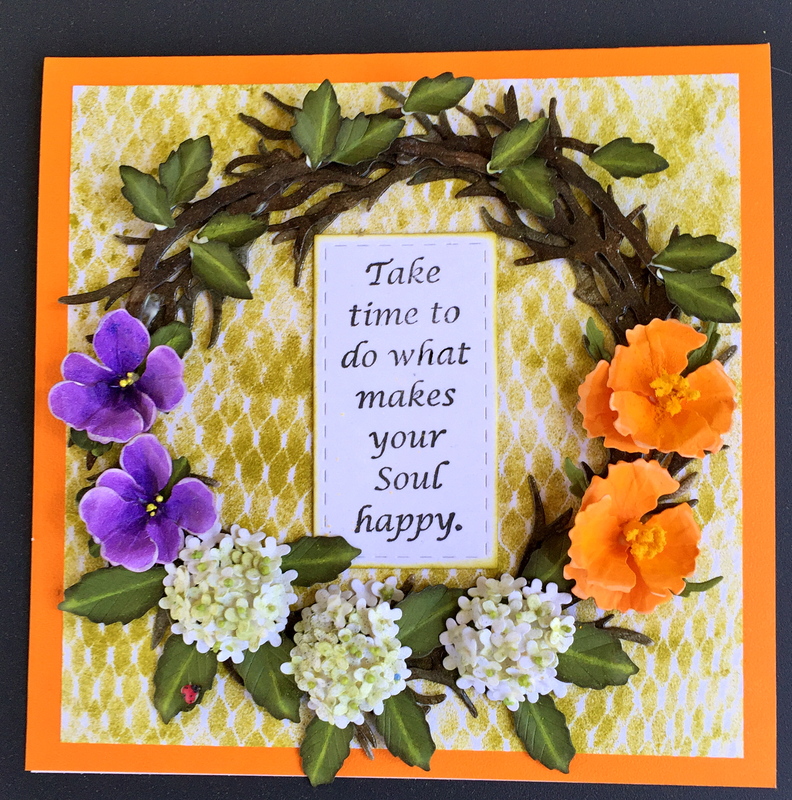 Not only dimension, but the paper I use, products for shading and coloring, and today, embossing powder to create a natural-looking wreath to set my flowers on is important to me. Going that extra distance makes me HAPPY! This project today started with creating an unique background using a plastic mesh bag that I bought new potatoes in. 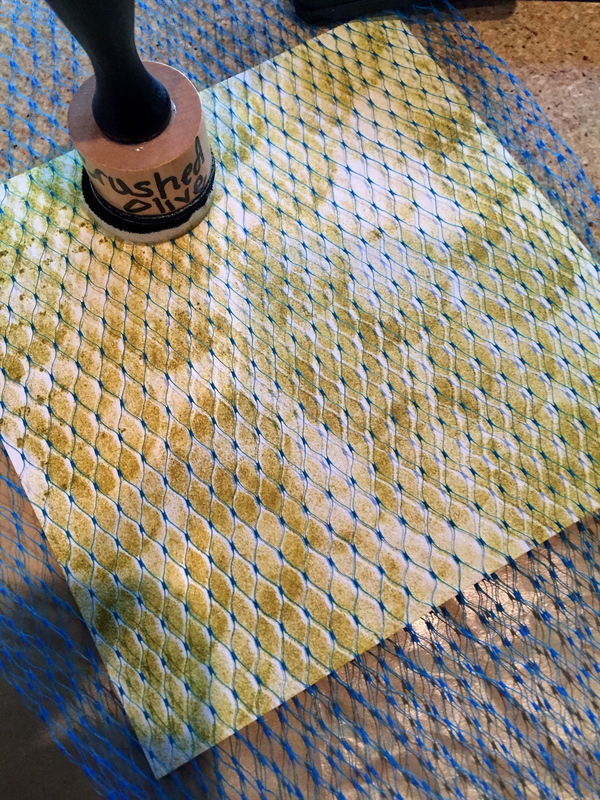 Dabbing Distress Ink over the bag made the interesting pattern that I placed my wreath on. I don’t throw anything away that may be used for backgrounds, something I’m sure you can relate to. I trimmed Colored Soft Finish card stock/Bright Orange into a 6-inch square card, then, the layer was trimmed to 5 1/2-inch square using Soft Finish White 100 lb card stock. I also die cut two Round Grapevine Wreaths in this same card stock. 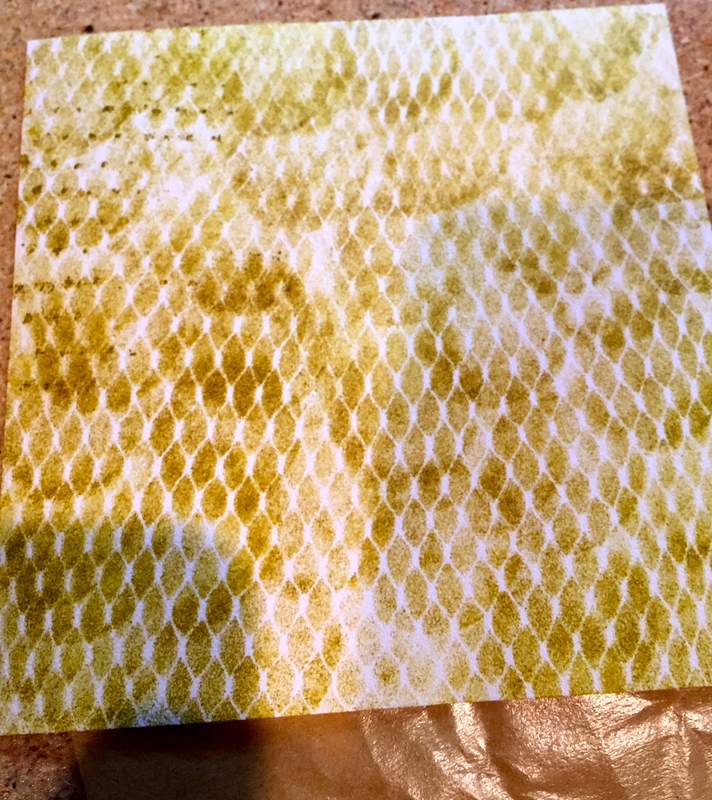 I slid the white square into the mesh bag to create the background print. 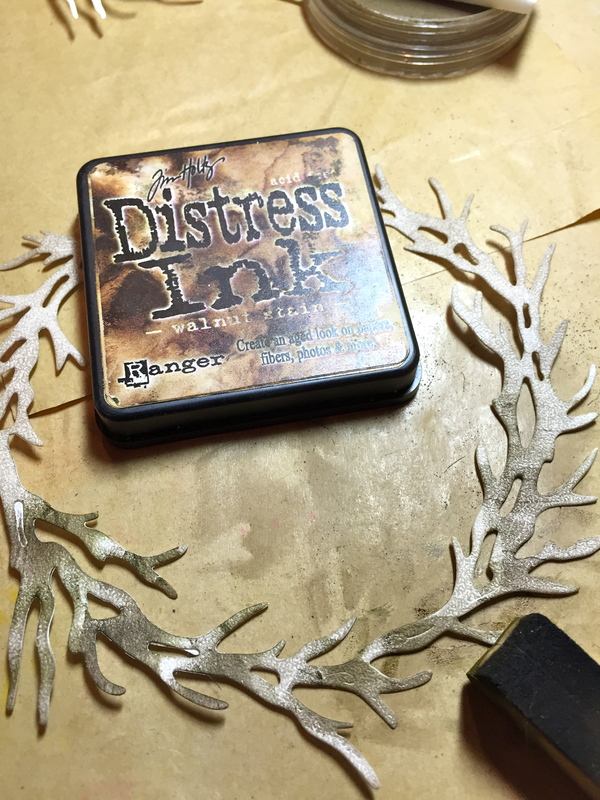 I used Distress Ink/Crushed Olive to dab over the bag for my background. Fill in as much as you can, but the “shading” created by dabbing makes for an interesting look. 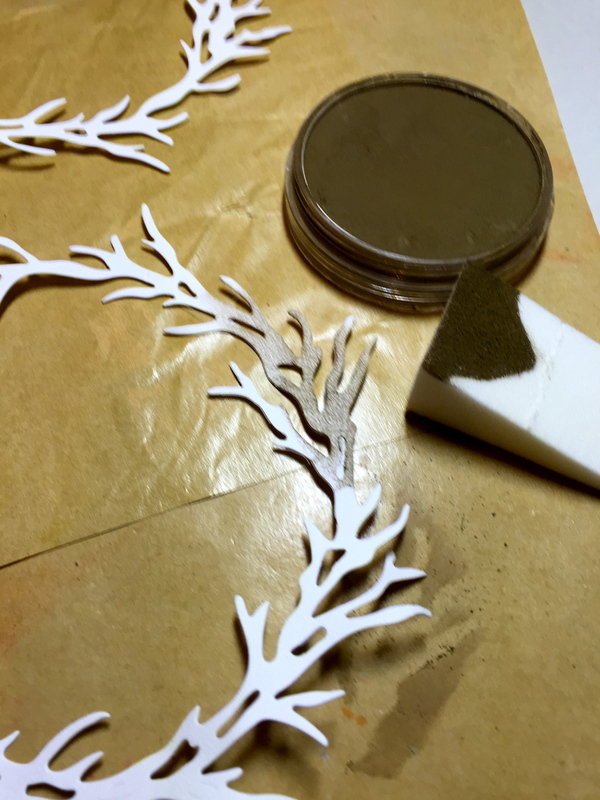 To create the natural-looking wreath, I first colored the white card stock all over with PanPastel/Raw Umber. Next, I used Distress Ink/Walnut Stain and shaded darker area. 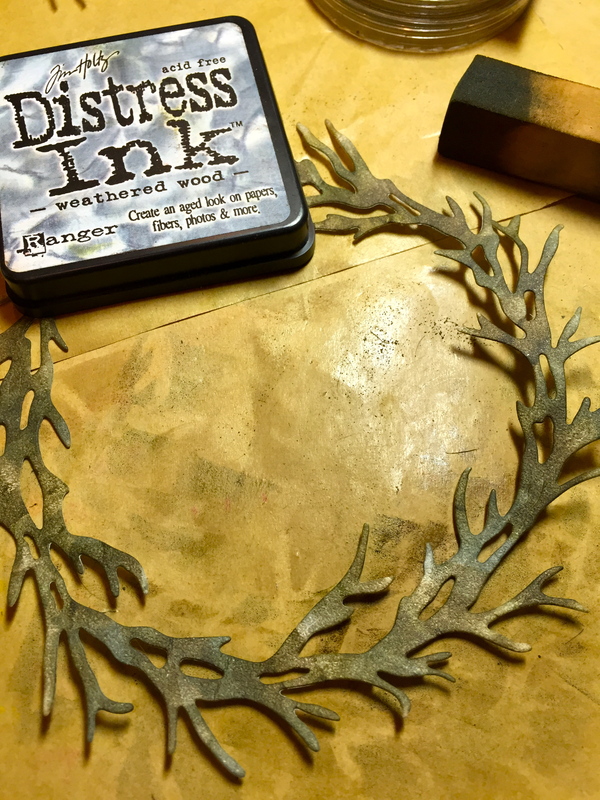 Finally, I used Distress Ink/Weathered Wood to add more depth. I also colored the underside with the Walnut Stain. Repeat this process with the second wreath. 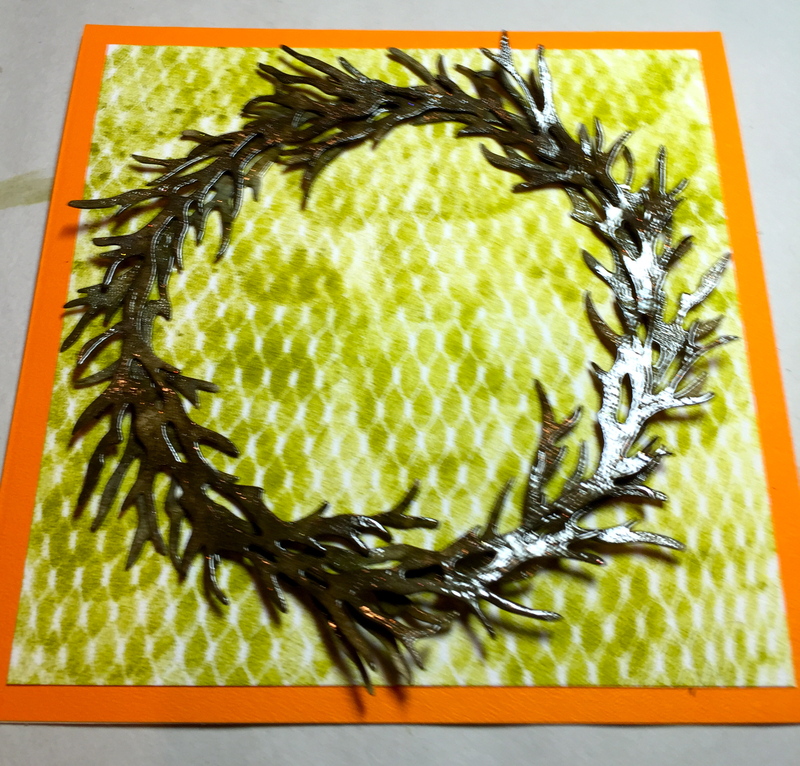 Once I was satisfied with the color, I used Tsukenko’s VersaMark ink and dabbed all over the wreath. 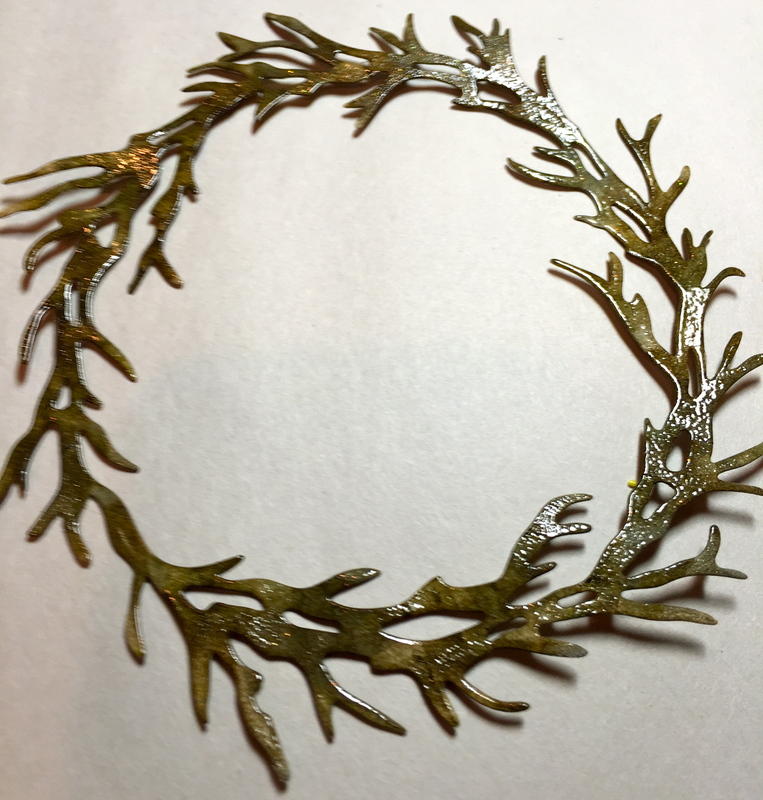 Then, I used Ranger’s Super Fine Detail/Clear embossing powder to sprinkle over the wreath. 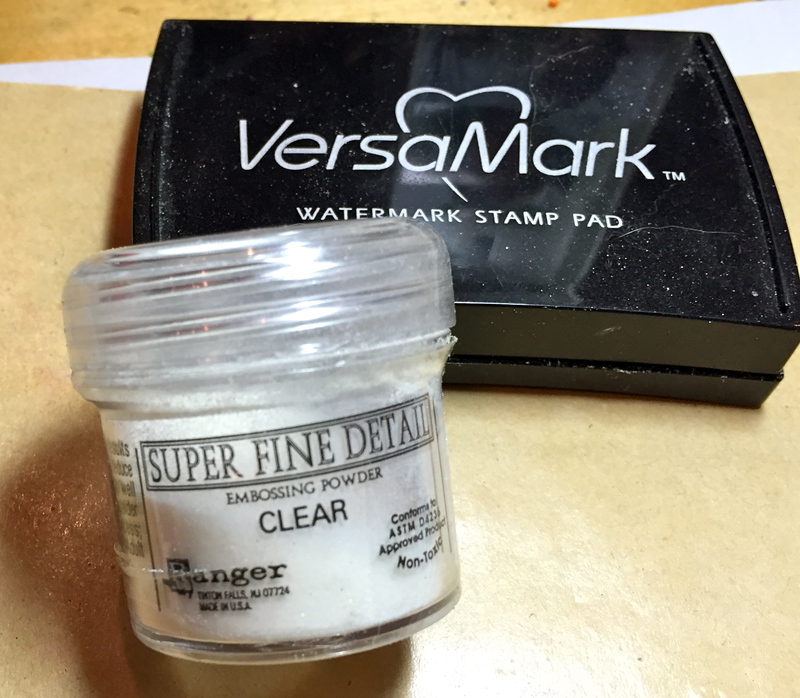 I used a heat gun to set the embossing powder. I used a toothpick to dab Beacon’s Kid Choice glue on the underside in several place and set it in place on my card. 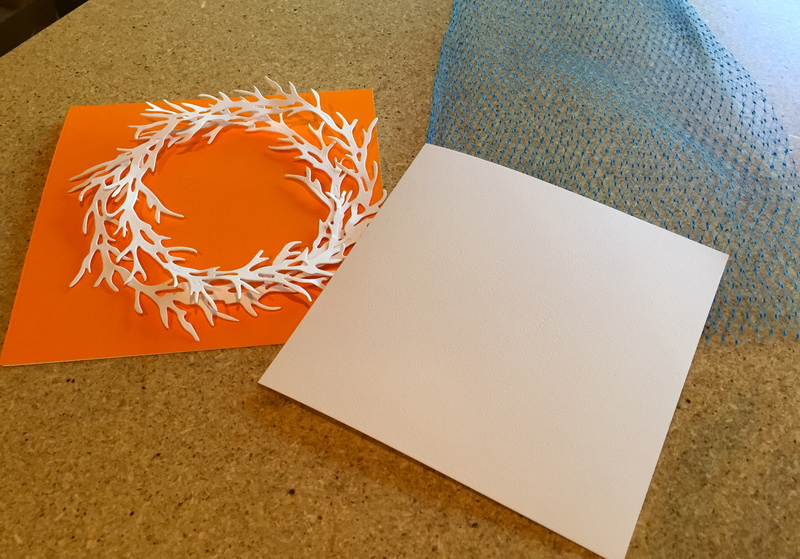 Repeat the gluing process with the second wreath, off-setting it on top of the first. My inspiration today was my beautiful Viburnum bushes blooming outside. Spring has definitely come early here in North Carolina, even though this weekend Mother Nature is still reminding us she’s in charge! 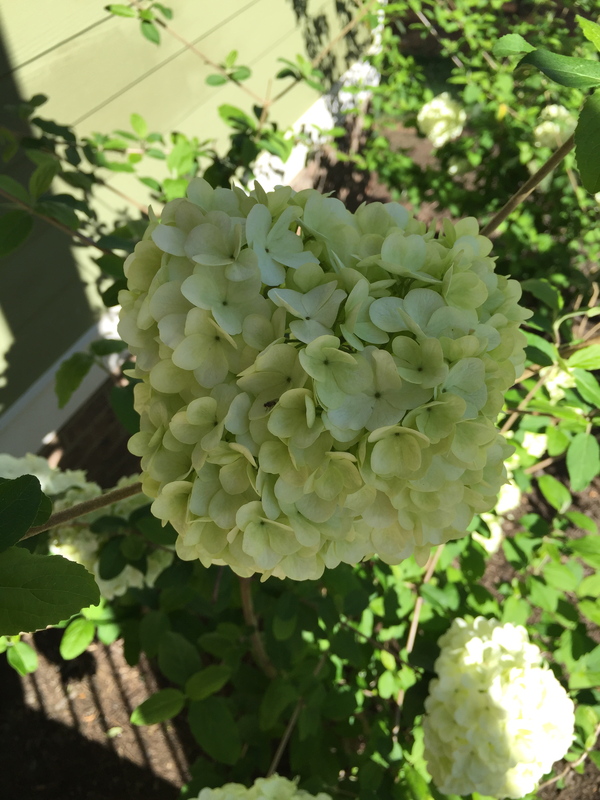 Of course, I don’t have a Viburnum in my Garden Notes collection, but I do have a Hydrangea and this variety certainly comes close to that. 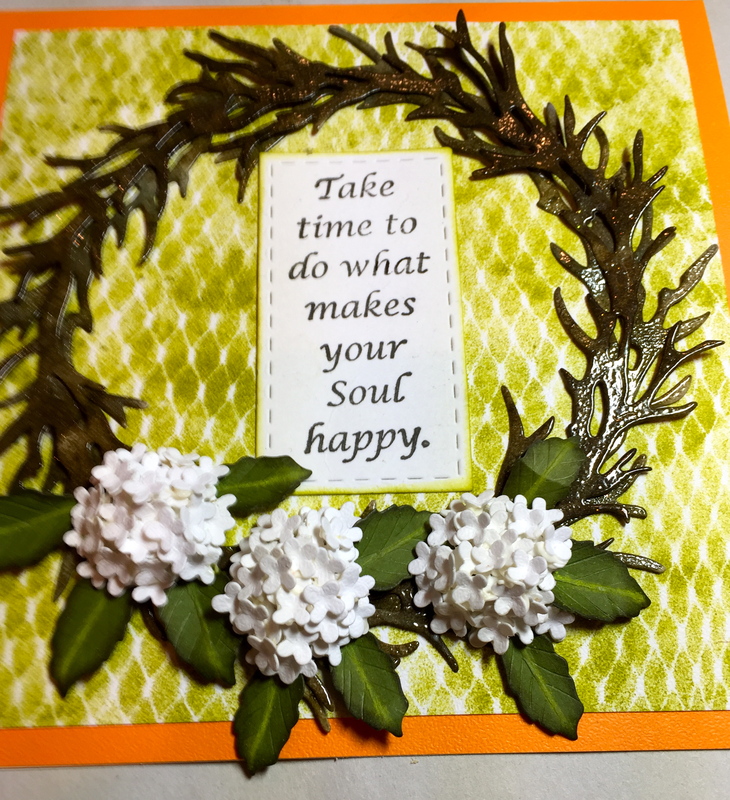 After die cutting just the “ball” of the bloom twice, I glued them onto the wreath and added the leaves, shading them as I have instructed in my videos. Die cut petals in Soft Finish White 85 lb card stock. Shade the petals in the center, using PanPastels/Orange. Shape, pinch and bend as directed on the videos. 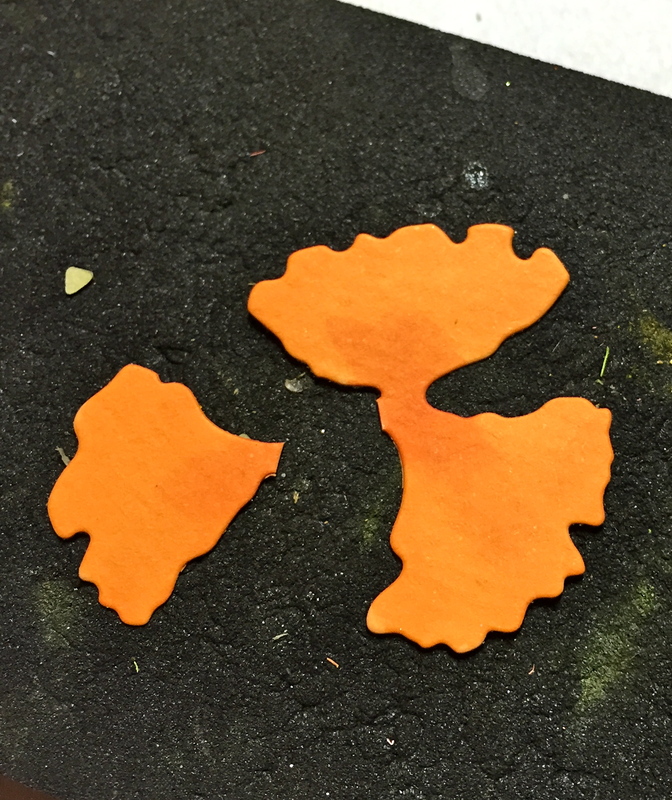 The stamen is rolled and the filaments are lightly dipped into glue and then, Yellow Pollen. I added a couple of Pansies to balance the color on the left side. 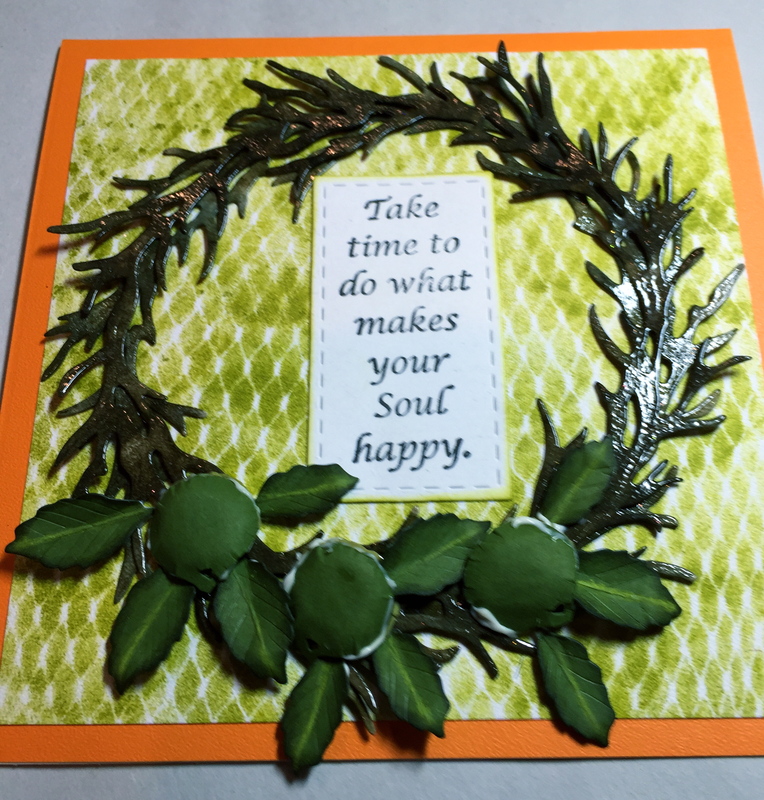 Finally, I die cut a few branches, colored, shaded, and embossed as I did the wreath and added some more green leaves. 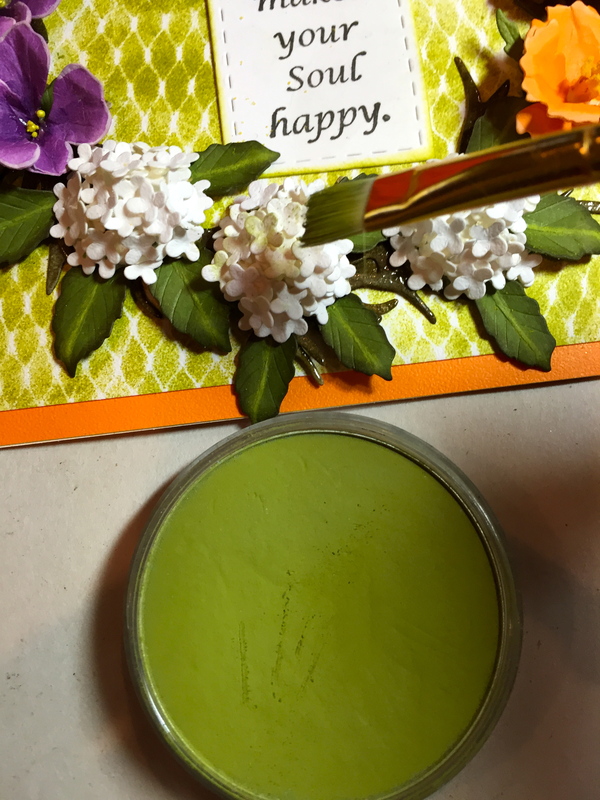 I finished it off by stamping one of the quotes from “Seeds of Thought–Take Time.” This quote reminds me no matter how crazy life gets, be happy! Would I be able to get one of your “Wagon Wheel” cards.? Gorgeous! I pinned it to my Susan’s Garden Club board. Susan this wreath is gorgeous and the techniques are awesome! Thank you so much for sharing…I always look forward to your posts! I must give these techniques a try.